Defeated in World War II, Imperial Germany completely collapsed and its territory was divided into two spheres, liberalist and communists. Then in 1955, West Germany was admitted to the Western European Alliance and the West German Defense Forces was re-established as a new member of the NATO powers. As West Germany is adjacent to the communist sphere, problems on national defense was much thought of. To defend the border-line an armoured unit was established. The German techniques by which the Tiger, Panther and other excellent tanks were produced was succeeded by this Leopard tank that appeared in 1961 in West Germany. Leopard also has the name of 'standard Panther". It was prototyped in 1961 and 1962 and was formally adopted by the West German Army in 1963, prior to the adoption of the French A.M.X. 30. 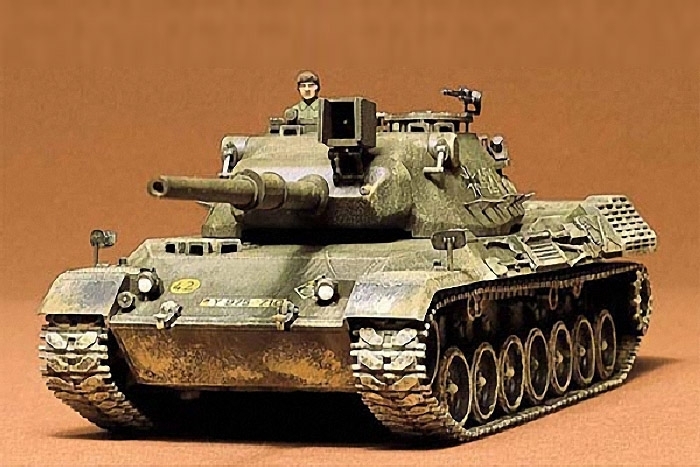 In 1964, the West German Army placed an order for 1,400 of this tank and the first tank, mass produced, was delivered by Krauss Moffei in Munich. The crew of the tank is four and L7A 1 105mm gun made in Britain is used as its main gun which is common to tanks of the NATO forces and has the same destroying power as that of the British Centurion, U.S.A. M60 and Swiss Pz 61. Its shooting sight is based on a range finder system and it can shoot a target at a distance of 1,000 meters even at night by simultaneous use of infrared rays. Its engine is a water-cooled, 10 cylinder multi-fuel engine by Mercedes Benz. The maximum high speed is 65km/h. Not only diesel oil but also gasoline and fuel for jet engines can be used. Its chassis and body is water-tight so that it can cross rivers at a depth of 4 meters underwater. Thus, this tank is a modern excellent maneuverability tank of which importance is attached.